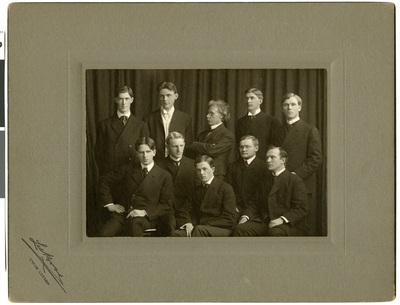 "Luther Seminary Glee Club, St. Paul, Minnesota"
Music was always an important part of church life among the Norwegian-American Lutherans. Pictured here is the 1905(?) Glee Club of Luther Seminary. Many of these men went on to hold positions of prominence in the church. Seated, left to right: Thaddaeus Franke Gullixson (1882-1969) served as president of Luther Theological Seminary, 1930-1954, and as president of the American Lutheran Conference, 1944-1955; Johan Carl Keyser Preus (1881- ); Nils Martin Ylvisaker (1882- ); Henry Ingrebritsen (1876- ); Axel Bergh (1873- ). Standing, left to right: Sigurd Christian Ylvisaker (1884-1959) served as president of Bethany College, Mankato, MN 1930-1950; Nils Stockfleth Magelssen (1880- ); Professor John Dahle (1853-1930) was an accomplished composer and arranger of hymns and choral music and served as one of the editors of the Lutheran Hymnary (1913), which was one of the first English-language hymnals used by Norwegian-American Lutherans; Hartwick Carinius Smeby (1879-1945); Sigurd Bernhard Hustvedt (1882- ); Back of photograph reads: Luther Seminary Glee Club, Norw. Synod R62A.